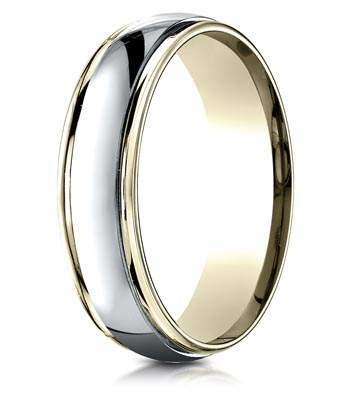 A mixed metal design makes for an incredibly versatile men's gold band. 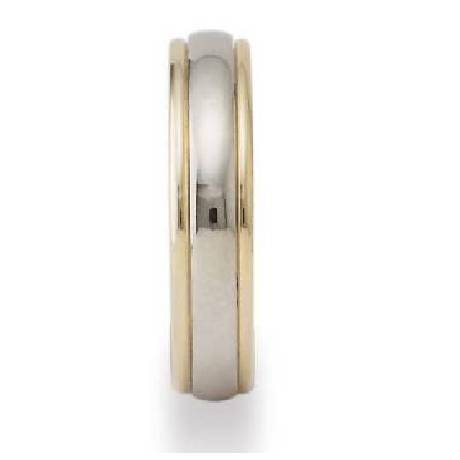 This designer gold wedding ring for men features a 14K white gold center bordered by 14K yellow gold edges. A gleaming polished 4mm comfort fit band means that this two tone ring is as comfortable as it is eye-catching.Comfort fit rings usually measure 1/2 size smaller due to the additional metal inside the ring. We recommend having your finger measured for a comfort fit ring at your local jewelry store. When i went with my fiance to look at rings he said he wanted a classic wedding band no bling no textures no designs lol so I looked and looked and couldn't find one that I liked and that fit his description until I saw this ring it was perfect and the engraving feature was the icing on the cake! Im very satisfied with my purchase and I know he'll love it.